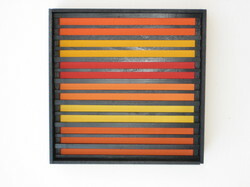 Jerard Less is a new artist with Real Gallery exhibiting in 2010 and 2011. His works are noteworthy and a must see especially for buyers that enjoy the craftsmanship of wood working. Jerard is an Austin based artist. His collages, constructions and assemblages are creative, delightful. His work reveals his interest in architectural features with a nice touch of sophistication, clean lines, beautiful stains, colors. Real Gallery is pleased to introduce Jerard Less in his very first solo exhibition.